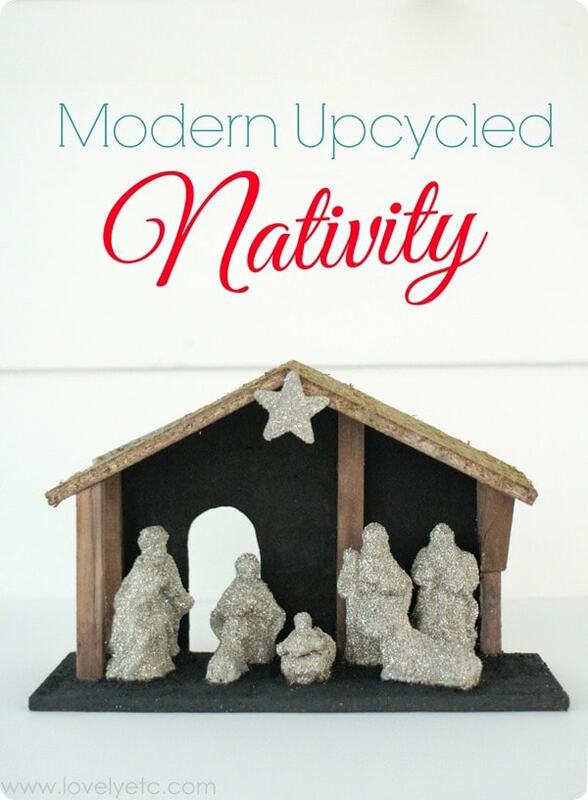 Modern Upcycled Nativity - Lovely Etc. Normally I’m not much of a glitter and sparkle kind of girl. But Christmas time is different. When the holidays roll around, the glitter comes out. In our house you know Christmas is coming when you hear Mariah Carey belting out the Christmas songs and suddenly everything is covered with stray bits of glitter. 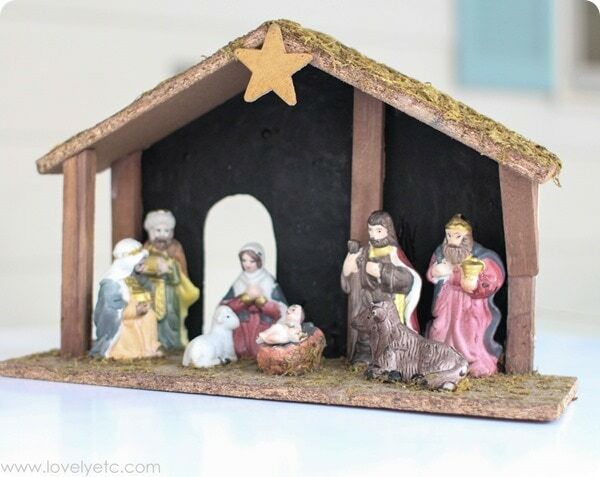 Somehow, in all of our Christmas decorating, we’ve never had a nativity. I made a small nativity ornament last year, but this year I really wanted a real nativity, especially with my two year old Griffin becoming old enough to understand what it is all about. But of course, it had to be a nativity with style. 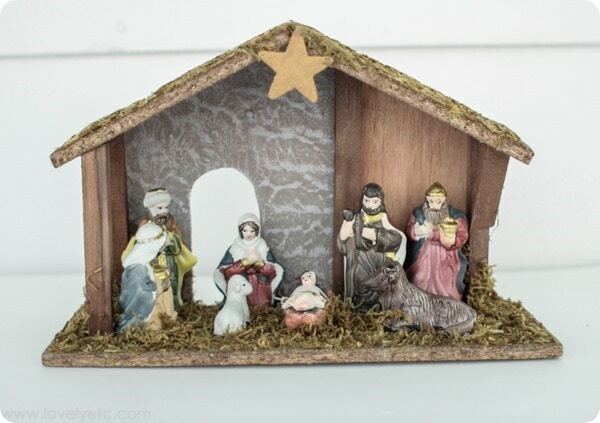 I picked up this super inexpensive little nativity at a discount store. Not bad but it was no great work of art and it was a bit too traditional for my personal taste. So I decided to give this guy a makeover with some gorgeous German glass glitter. I started by putting a piece of poster board under my project to catch as much stray glitter as possible. Then I started pulling off as much of the fake hay as I could from the roof and floor. There were still some small pieces left but it looked much cleaner already. I decided to paint the back of the stable black to better highlight the main characters. My nativity set is all one piece with the people attached to the stable floor which made painting a little tricky in some places. I just used a tiny craft brush to get into hard to reach spots. I let the black paint dry thoroughly and then brought out the glitter. I painted each figure with gray paint and then while the paint was still wet, added glitter, shaking the excess off onto onto the poster board. 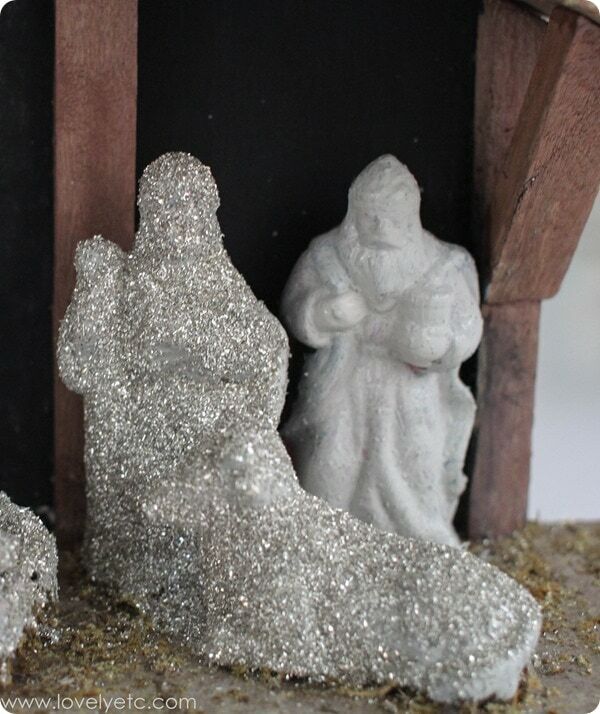 The gray paint made everything under the glitter a nice uniform color so I didn’t need quite as much glitter. Once that was all dry, I used a small paintbrush to dot school glue wherever there were bare spots in the glitter and added more. The star got the same treatment. 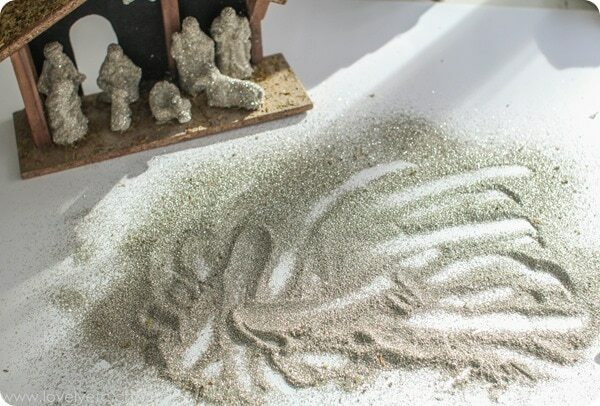 Once all of the stray glitter had been shaken off, I decided to paint the floor of the barn as well, mixing my gray and black paint together to make a slate gray color. As I was working on this, Griffin was watching with huge interest. He wanted to know what it was called and who everyone was. He loved the sparkly glitter and was fascinated by the baby Jesus. I had to step away for a few minutes to answer a question for my husband…and I bet you have a pretty good guess what happened next. I came back to find the entire jar of glitter dumped all over the table. Glitter everywhere. If you know anything about glitter and how it clings to every available surface with some sort of magical magnetism, you know this was not good. I thought about how much time it was going to take to clean everything up. And how we would be finding mysterious bits of glitter around the house for weeks. But I also thought about how it was just a little mess. And maybe finding glitter everywhere didn’t have to be a bad thing – it was definitely a good reminder that Christmas is coming! Not to mention, hearing Griffin’s sweet little voice asking to see Jesus again was definitely worth a bit of mess. 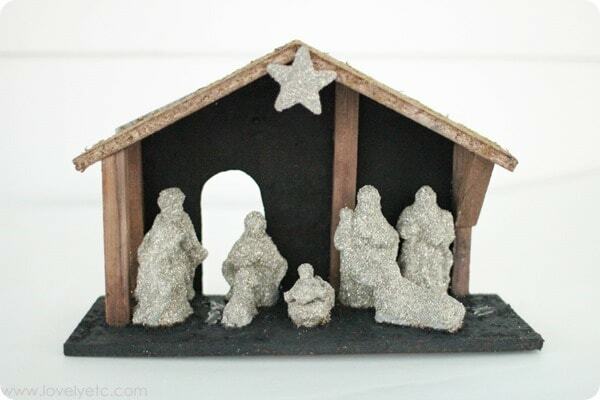 And once everything was cleaned up and squared away, the nativity turned out pretty sweet.